Get a $249.20 DISCOUNT on a 12-PACK OF SPECIAL 20’s (All 12 Major Keys!) – Plus a FREE HOHNER HARD CASE! Great for Professionals and Beginners! Great Tone! Great for learning to Bend! Bang for the buck, this is my personal favorite instrument by a long shot. It’s the harmonica I use and it’s the instrument that makes it easiest for beginners to learn to bend. 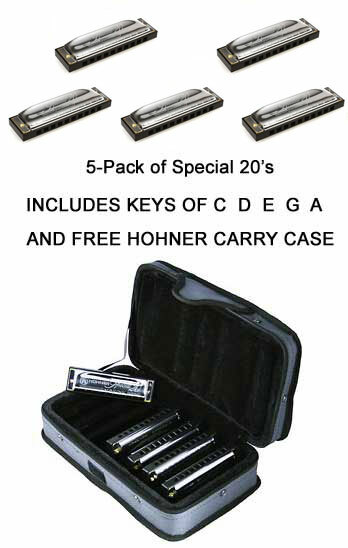 You’ll need to spend 2 to 5 times the money on other brands of harmonicas to match its performance. Awesome response, superior bendability and the sweetest tone ever. The Special 20 harp is the first choice for those learning to play. Its special airtight design makes it the most recommended go-to harp for harmonica players of any style, including blues, country, folk or rock. The plastic comb doesn’t absorb moisture making it longer lasting. Harp of choice of harmonica virtuoso John Popper (of Blues Traveler) and played by Bob Dylan on his 2007/08 tour. Chances are your favorite player has several of these harps in his case. i find every bit of information helpfull and i’d like to thank you for the help . i am at the very basic biginner’s level but i do so enjoy myself with this learning curve . It’s not something that im going to loose interest with , determination is with me and playing the Harp is so cool . Sorry Bill but the 5 pack is pre-selected and cannot be changed. However you can choose all your own Keys with the 7 and 12 packs. I am interested in buying 16 holes C Harmonica. Hello jp, i like to purchase to play blues music the A harp? I had the Hohner Special 20 key of C for a few weeks based on your recommendation and I love it. Very much a beginner but I did just go and order Special 20 in key of A and D.
Thought i would share this with you,I first picked up a Harmonica in the early sixties for my own amusement, 21years later I was told one day that i was playing it upside down I then tried it the right way (impossible) I still play it upside down. Just for you beginners.